The TFH Synthesis includes 60-64 classroom hours to cover Touch For Health levels 1-4 , usually taught over 4 weekends or over a week. The workshops will provide practical, hands-on experience in the TFH system of postural, energetic and mental/ emotional balancing. A certificate of attendance is provided for participants in levels 1-4, from the International Kinesiology College, which is the only authorized worldwide organization responsible for curriculum and standards of Touch for Health®. Once the Touch For Health Synthesis is completed you advance to the 15-16 hour Proficiency Skills Workshop confirming your practical TFH skills and theoretical knowledge. 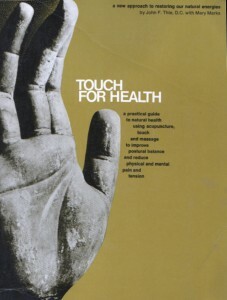 This includes a written and practical assessment, where use of your Touch For Health book is encouraged. The Certificate of Proficiency from the International Kinesiology College is issued upon successful completion of the assessment. After completing your Touch For Health Proficiency Skills assessment, further advanced training is available to become a Certified Touch For Health Instructor by attending the TFH Instructor Training Workshop (ITW). TFH Instructor Training Workshop (ITW) is important for practitioners who wish to provide individual Touch For Health sessions and communicate TFH effectively with their clients using the self-responsibility model. As a Certified Touch For Health Instructor you will then be able to teach Touch For Health courses in your community and provide continuing education CEU for Licenses Massage Therapists and Acupuncturists, as an NCBTMB and NCAAOM provider. Upon successful completion of the ITW, which includes further practical and written assessment, you will be registered with the International Kinesiology College and receive a Registered Touch for Health Instructor certificate, authorizing you to teach the TFH Synthesis. *IMPORTANT: While any Continuing Education (CE) certificates for classes are issued through TFHKA, which is approved by the specified national governing bodies, it is the student’s responsibility to check with their local professional boards to ensure that the certificates issued will be accepted. With laws constantly changing, the final responsibility to take TFHKA classes based upon receiving CEs rests with the student. Completing the TFH Synthesis, Proficiency Skills Workshop and Instructor Training Workshop builds a solid foundation in the fundamental kinesiology system, Touch for Health®. You will learn how to balance muscles via the meridian energy circuits from Traditional Chinese Medicine/acupuncture, as well as spinal reflexes, neurolymphatic reflexes, neurovascular reflexes, and neuromuscular reflexes. Developing a holistic, self-responsibility approach, you will learn to restore balance, improve posture, alleviate pain and stress, recover mental and emotional harmony and enhance vitality. With practice, you will gain confidence and competency with the techniques of Touch for Health®. The workshops provide an environment to work with a variety of people in a nurturing and peaceful setting, and equip participants with a host of valuable skills. We look forward to welcoming you to the Touch For Health family!